I've included some pictures of what the bike was like when delivered to me. It took me a while to work out that there was an ignition switch fitted on the bike and that was the reason for the bike having one sidepanel! Good start for a project, although the running gear is Z1000 and the date means it could be one of the last Z900 A4 or a Z1000 A1. Do you know if it's an import? 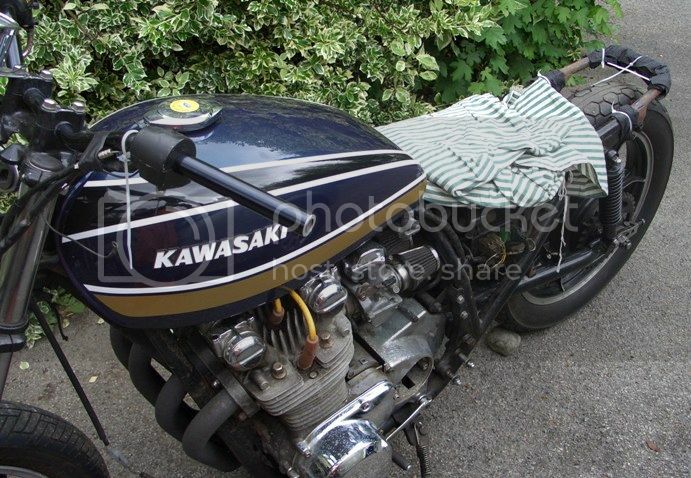 I notice it has KZ1000 A2 front calipers / forks - KZ900 A5's were only sold in 1977 - so if the date on the title matches that, confirms it was A5 when standard. The seller stated that the bike had Z1R front and rear ends (1978), hence the non Z900 appearance. Yes the bike was imported from US in 1997, total engine mileage 23K with all MOTs back to the date of import. 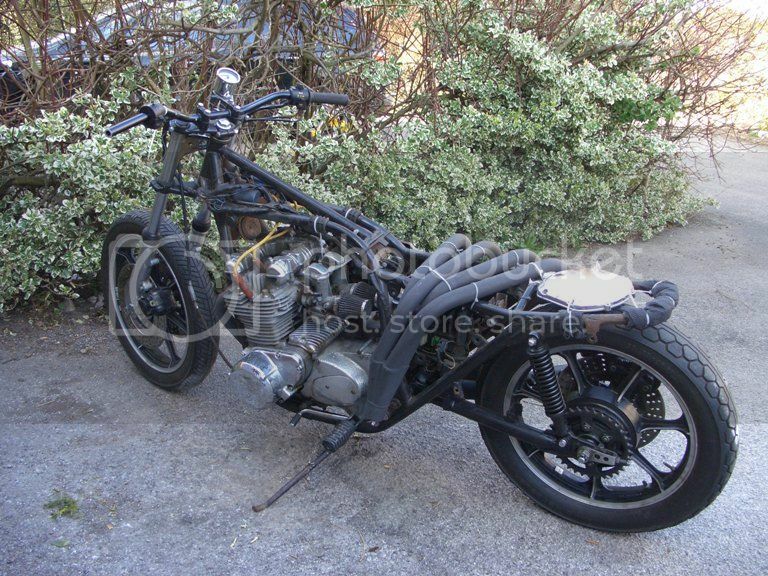 The Z1 is a fantastic looking bike and my idea for this project is to use the bits that I think best describe the Z1 and use other parts where suitable. 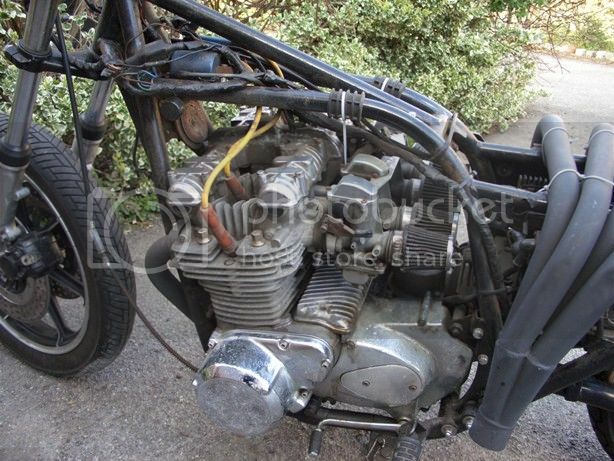 I've decided that I'll strip and rebuild the carbs first, change oil, check valve clearance, plugs, ignition timing and then start the bike to see how the engine runs before a full disassembly. 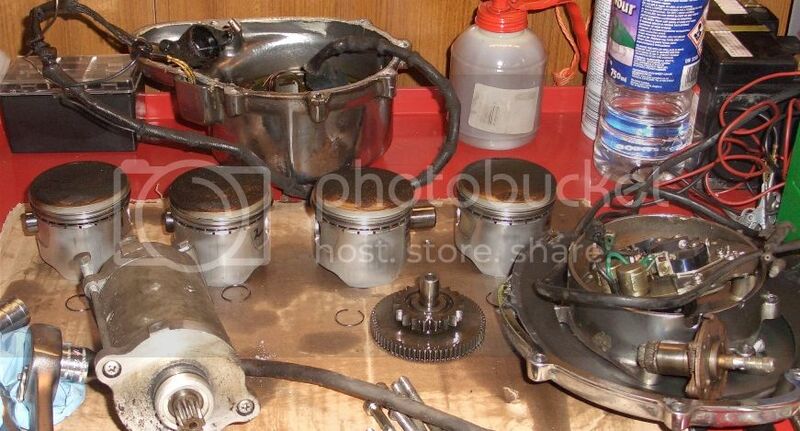 At least I'll have an idea of any potential engine problems or possibly a non starter for a project. Following this I'll then do a full disassembly and send the frame away to be checked. I'm planning to do as much as possible myself, so I imagine the project duration is going to be 18 to 24 months. ASSEMBLED FROM PARTS LEFT OVER IN THE USA FACTORY. That looks to be an excellent basis for a modded Zed. Do you have a short list of your prefered running gear. 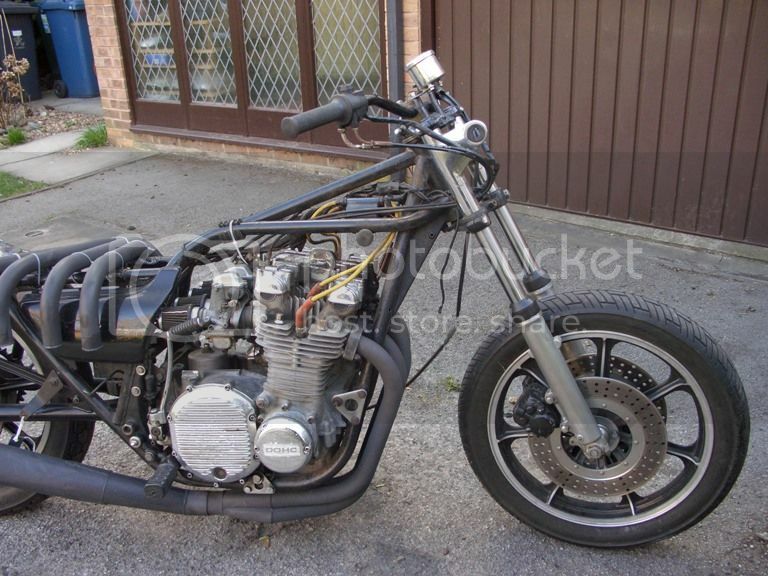 Will it be USD forks & a Monoshocked rear or RWU & twinshock? Feel free to ask what works/fits easily, there's plenty of free advice available & best of all, you only need take it if you want to! Thanks GB for the words of encouragement....Your project looks interesting also, I'll keep an eye on it. Current ideas are twin shock rear swing arm and at the front USD forks. 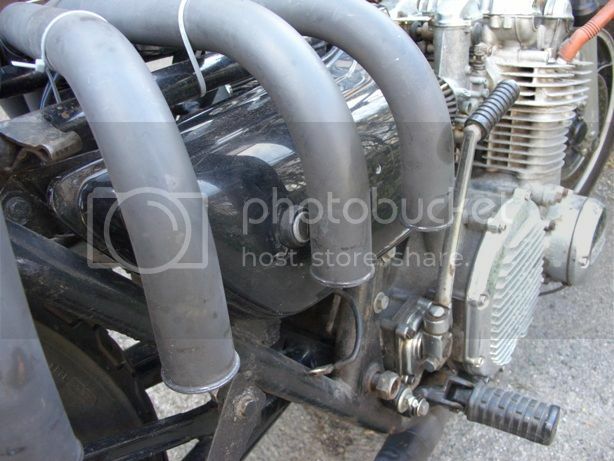 If anyone has experience or ideas on what Twin Shock swing arm that allows a decent width rear wheel/tyre to be fitted and suitable front end using USD forks please let me know. 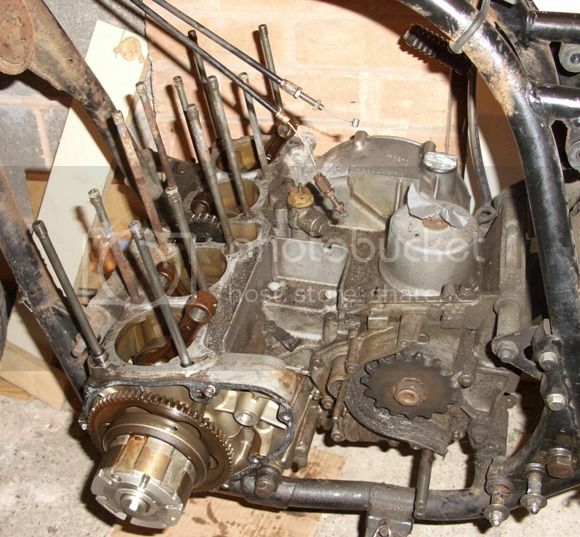 Decided to get moving with the project and get the engine out and investigate general condition of main components. My attempt at single handed removal of engine. It went OK, just not so easy to find correct balance point. 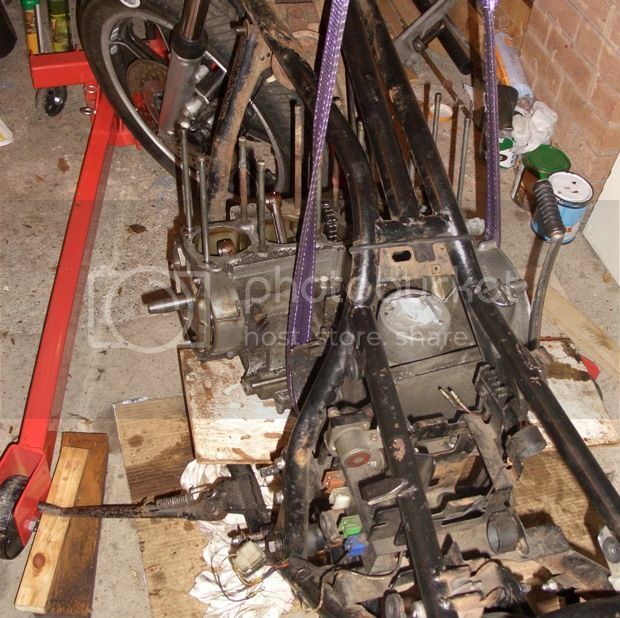 Engine out and safely placed on work bench for remainder of strip. 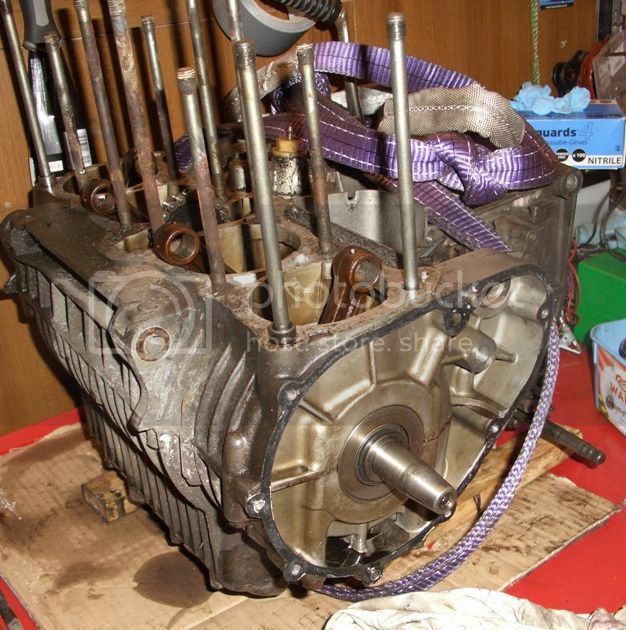 The pistons are 50 oversize, but almost like new and condition of cylinder bores looks great. That looks like a great starting point. My bike started out as a KZ900 A4 and now has Z1 side panels and well as many other mods. As you may know, the Z1 side panels have very different mounting points to the A4/5. In the end I had to fit Z1 style rear engine mounting brackets and get Harris to fabricate and weld on new side panel lugs, so it wasn't a simple job. Worth it for the looks though. You may have to modify the battery box and tool kit holder as well. The A4/5 use the battery box for one of the RH side panels lugs and the tool kit for another. The tool kit mounting point is usually broken anyway as it's a poor (weak) design. I ditched all of the A4 stuff under the seat and fitted a smaller bespoke battery box with a modern lithium ion battery. I imported lots of parts from Japan, most of which were intended for Z1 use not Z900 so I became quite knowledgable about what fits and what doesn't. Thanks for the words of encouragement and I followed your build as it progressed. It really has given me lots of inspiration to get moving. I also read the article in Practical Sportsbikes on your Z900 "Sanctuary". Fantastic stuff and I look forward to seeing the bike on the ZIOC stand at Stafford this weekend. More to come, but hoping to get some tyres fitted once I am happy with the wheel rebuild.